In reality, to truly see off the Audi RS 6 Avant in style, I should have headed for the nearest autobahn and let it rip. 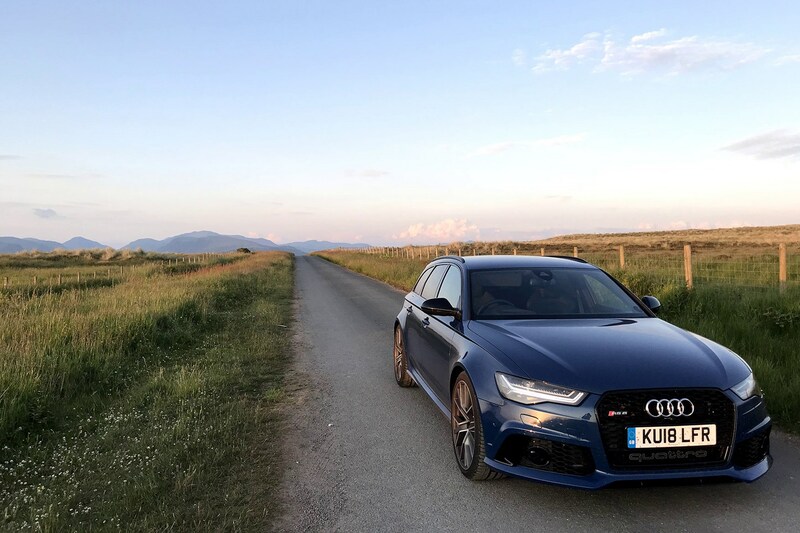 But as it is, I'm stuck in speed-limited Britain, and am making the most of it, still buzzing from the excitement of attacking deserted Lakeland roads on a sunny summer's evening – Audis not driver's cars? Pah! 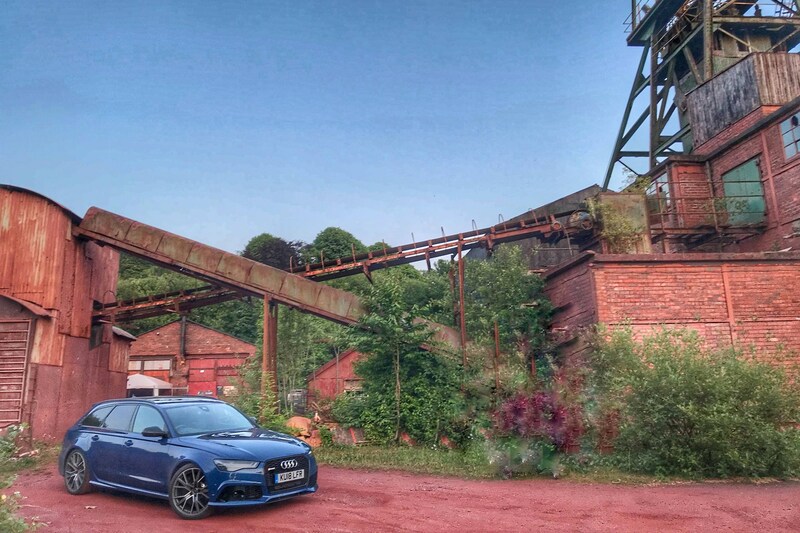 The idea of grabbing a properly challenging driving weekend in the RS 6 Avant came from New Cars Editor Adam Binnie. He'd secured a loan of the end-of-line example in Performance form for a last hurrah, and smiling as he tossed the key he simply said, 'enjoy'. And 36 hours on, we'd done just that. A quick trip to Cumbria to find some great roads was in order. And as the car cools following its exertions on sinuous mountain roads, gently ticking away, it's difficult not to feel both elated and sad. Elated because this car is brilliant, and sad because within weeks, it'll no longer be with us. The RS 6 Avant has been with us since 2013, and it's already established itself as a bit of legend. It's not unique in the market place, with its sternest rival being the Mercedes-AMG E 63 estate – but if you're looking for one of the fastest cross-country family cars on the market, this is as good as it gets. In short, it's a high-grip, high-performance, weapons-grade superstar. 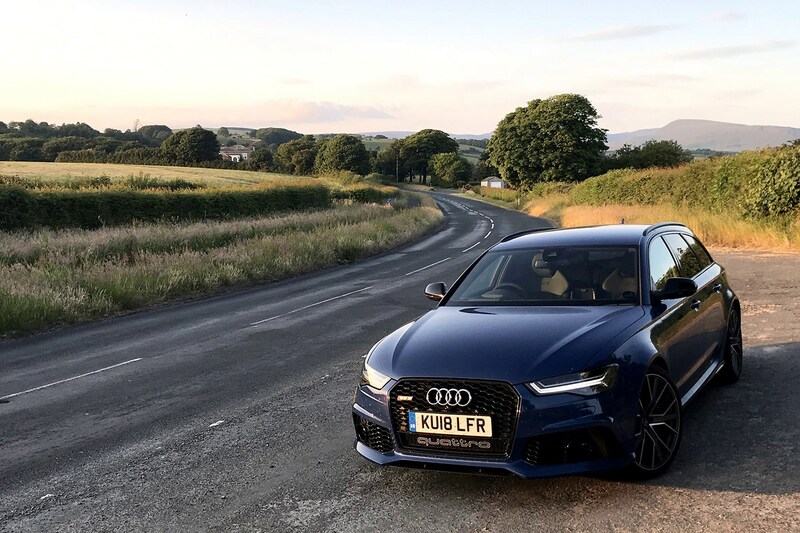 The Audi RS 6 Avant Performance is powered by a 600hp, twin-turbo 4.0-litre V8, and reigning it all in is the tried-and-tested Quattro permanent four-wheel system. It rides on enormous 21-inch alloy wheels and the widest tyres you'll see this side of a Lamborghini – and in this shade of blue and wearing subtly widened arches, it manages to look discreet enough to be ignored in traffic. 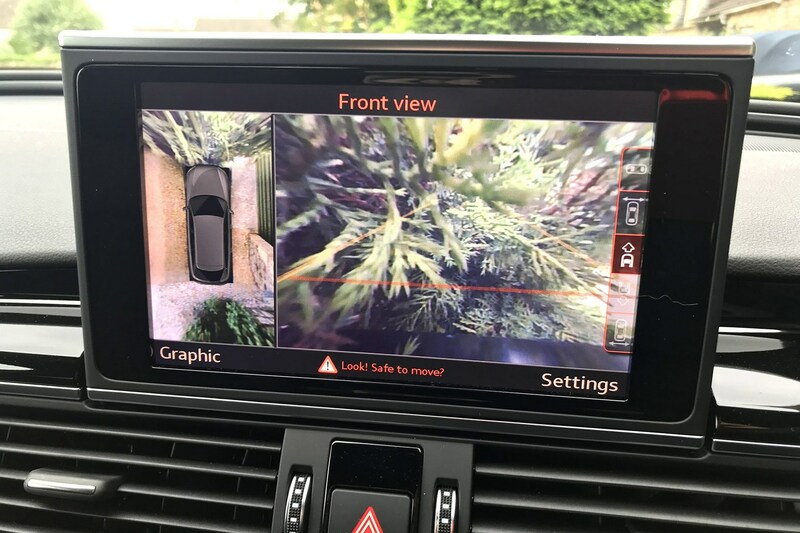 We won't bore you with a long list of equipment and tech, as that's detailed painstakingly in the Audi A6 full review, but needless to say, it's well-stocked. Despite having been around a while, and being a generation behind in terms of tech, sitting behind a conventional pair or instruments, and driving the old MMI are still very satisfying. Fewer distractions. What's the Audi RS 6 Avant like inside? Even before I'd left for the north, I'd concluded this was a car optimised for people who love driving. The interior lacks fripperies, and is made from high-quality materials that feel both good to touch and like they're going to last the duration. The driver's seat is set low, and is super-supportive. It's multi-adjustable, and I'm struggling to think of anyone who'd not get a decent driving position in it. The no-nonsense dashboard looks good, while the infotainment screen pops out of the dash agreeably. For most of the time I have it, I leave the screen hidden in there. Finally, it's treated to a B&O upgrade to its stereo system. It's been fitted with 14 speakers and has a total power output for 1,200watts. I'd love to tell you that it sounded worth the £6,300 upgrade cost, but I can't – I can't remember listening to it instead of the soundtrack provided by the 4.0-litre V8 with performance exhaust. Sorry. Less of that. What's the RS6 like to drive? Getting to know the RS 6 on the motorway run north takes about two minutes. In order to keep up with the flow, you learn to use the first couple of centimetres of throttle travel, and once up to speed, dial-in the adaptive cruise control. It's typical 21st century executive car. 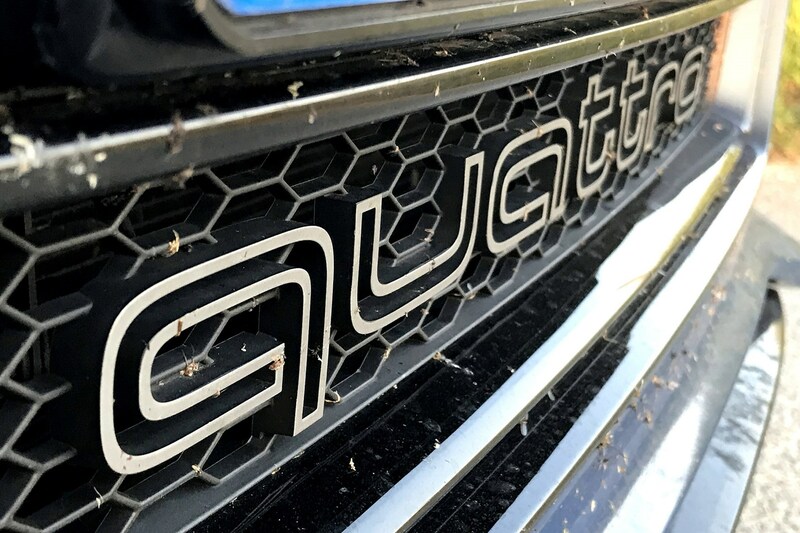 Thirst isn't much of an issue on the lope up the motorway – the V8 ticks off the miles at around 30mpg, which isn't far off the official combined figure of 29.4mpg. Can't complain at that. Cylinder deactivation keeps things on the right side of sane, although it's best not to spend too much time on how its high price and 223g/km emissions will affect your company car bills. 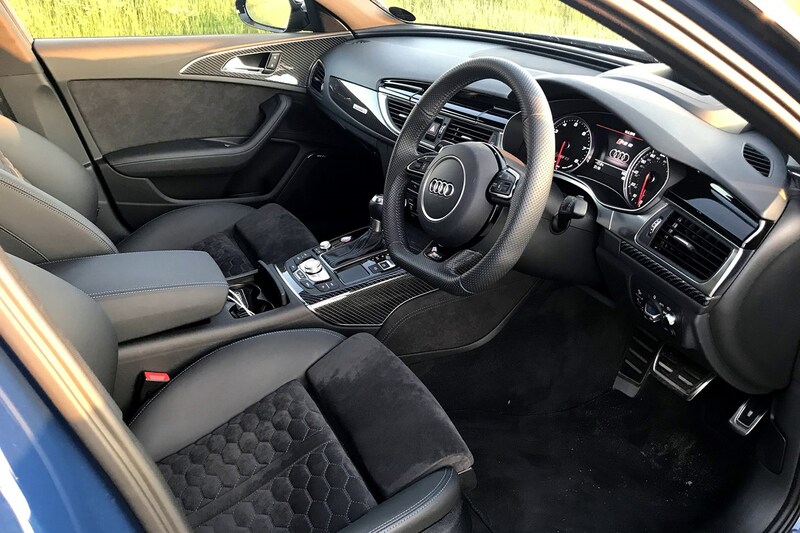 The same with the levels of comfort and noise – on the motorway, the engine settles to a background hum, there's very little wind noise, and those firm seats never come close to inducing backache. Impressive. As the roads get narrower, the engagement increases. On A-roads, it feels planted, hunkered down and ready for action. Deploying its weapon's-grade overtaking capability comes naturally, is addictive and very satisfying. A quick prod of the throttle, and you're round. No fuss, safe, and overlaid with a wonderful V8 backbeat. Progress is rapid, and as the Cumbrian fells hove into view ahead, the roads narrow further, and this RS6 wakes up even more. If you go into a quick B-road run expecting the RS to feel fat, inert and unweildy, you're going to be surprised. The steering is fast and well-weighted, and perfectly judged for the car's size and weight. It might be a five-seater estate car with a decently-sized boot, but it feels way more focused a driver's car than it has any right to. When we climb into the mountains, the reward is to find the truly sinuous fell roads. These present the perfect opportunity to select the most sporting of drive modes, and see how entertaining the RS6 Avant really is. Once engaged, the steering firms-up deliciously, and the exhaust starts tunefully popping and crackling even more on up- and down changes. Yes, it's a joy to hoon. 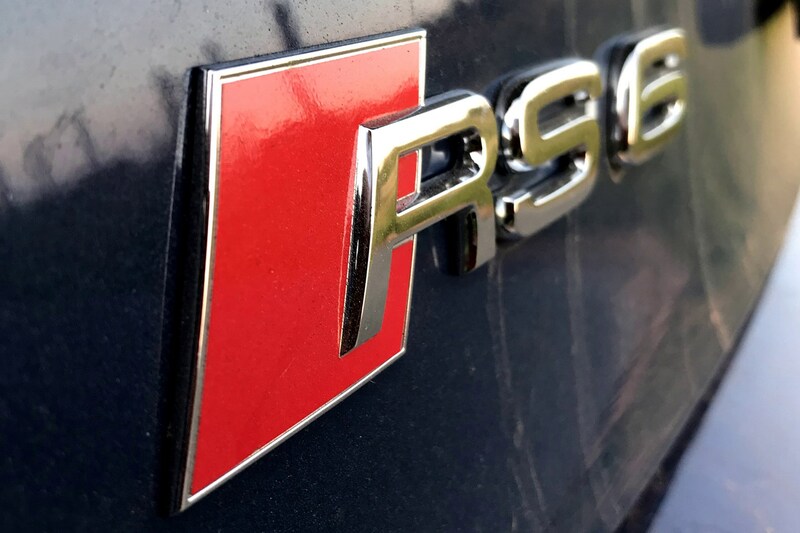 With a more aggressive throttle pedal, and the more sporting setting on the rear differential of the RS6's four-wheel drive system engaged, it becomes even more playful. But despite all that power, it never gets unruly, nor does it feel anything other than bolted down. This is just how a modern sports car should be. As the sun falls behind the mountains we're now driving through, the howl of its V8 bouncing off the stone walls that line the roads, it's hard not to consider this car as anything other than very, very special. After a night's sleep, it's easier to find some perspective. What makes the RS 6 a true legend is its combination of narcotic levels of acceleration and its all-round practicality. It may have a slightly more muted soundtrack than a Mercedes-AMG E 63 estate, but in the higher rev ranges, it pulls harder, and responds even more quickly. It also has a supremely wide power band, but up- and downchanging its eight-speed DSG transmission is a joy. In Sport mode, changes are lightning fast with the paddleshifters, and it's brimming with brilliant response. Again, it's hard to compute that this is a practical family car. But there's a new Audi A6 Avant on its way. And that means the current RS 6 Avant will go out of production. Given how Audi usually staggers it launches so the RS versions go on sale sometime after the cars they're based on – it means we're about to enter an RS 6 Avant vacuum. Given the trend towards downsizing, it's possible that the current car's monumental V8 will be replaced by a V6. Yes, that will probably be more powerful, and certainly more efficient, but you can be sure that after a long wait, the next RS 6 will probably not possess the intoxicating soundtrack of the current car. And that matters when the wail of the V8 and the staccato cracks from the exhaust are filling your favourite mountain roads with beautiful music. How did the Audi RS 6 Avant stack up? Back on the motorway and heading south, there's no escaping that at £80,000+, the Audi RS 6 is hugely expensive. And yet, it's also great value. What other car gives you near-Lamborghini levels of acceleration and combines with with an Ikea-friendly load area and family-sized rear seats? The Performance pack upgrades fitted to this car are what make it really special – and we'd forego many options in favour of this. What you get with this set of optional extras isn't just added speed, but lashings of soul thrown in. So, why the mixed emotions? It's certainly not down to performance. 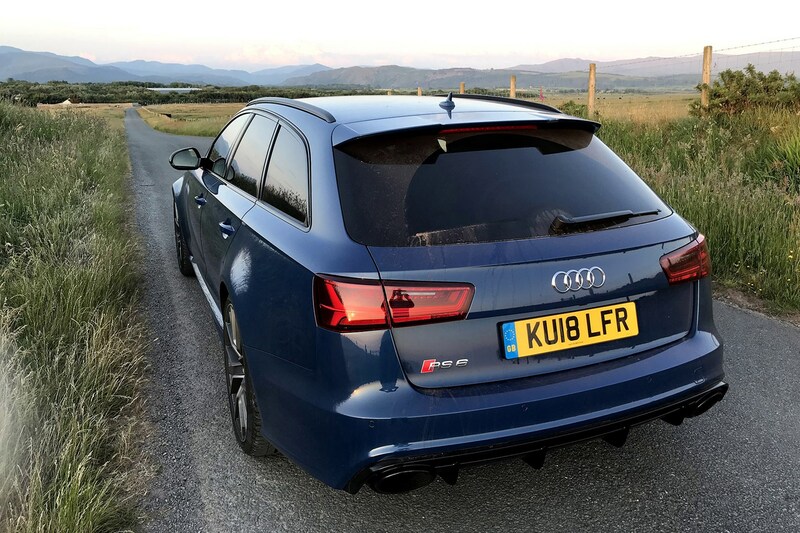 With 600hp on tap, and the undoubted advantage of Quattro all-wheel drive, the RS 6 Avant Performance is perversely quick for a full-sized estate car. It storms from 0-62mph in 3.7 seconds, and tops out at 189mph when specified with the Dynamic pack Plus, which our car is. These are just numbers – what it really means is effortless, easily accessed mid-range punch. The sort of pulling power that makes overtaking an amusing diversion, not the stressful affair it can be in a less powerful car on the UK's clogged roads. You just line-up, work out your trajectory, push to pass. You can guarantee that the next RS 6 Avant will do all this, and probably a little bit more on top for good measure. But will it do it accompanied by such a dirty soundtrack as this one – all pops, bangs and deep-bass V8 rumble? undoubtedly not. Our car with its optional sports exhaust turns up the race car attitude to eleven. We love it. And we'll miss it when it's gone.